I always talk about how my favorite childhood memories of Savannah entail walking down to get the paper with my Pop as he’d tell me stories about his childhood growing up in turn-of-the-twentieth-century-Savannah. But I’ve never gone into what would happen next. As I go through my internal dialogue, it seems the appropriate way to go about setting up today’s blog and will probably explain much to my beautiful fiancée’. Pop and I would fetch the paper then return to the house where he’d brew coffee to make any barista at Starbucks feel inadequate. He had this old metal thing that was tall with a long spout like a tea pot. The coffee pot made these loud gurbling sounds that I loved to listen to. It reminded me the baby stegosaurus, Glump, on one of my favorite cartoon at the time, Valley of the Dinosaurs. When the coffee was finished percolating, Pop would pour us both cups but added lots of cream into mine. I’d grab the milk and a bowl while Pop got the Kellogg’s Cereal Variety Pack. Grandma always got the ten-count for me because that one had Frosted Flakes and Apple Jacks. It was child nirvana. I still buy these on occasion. We’d sit at the kitchen table and drink our coffees, I’d read what Pop always called, in that old Savannah accent, “the funnah papers” while he read the paper front to back. We didn’t talk much which is why I think I love slow starts to the morning where I can read and sip my coffee. Pop was not a conversationalist when reading his daily dose of the Savannah Morning News. My favorite part was coming. Pop became his own political analyst when hitting the Opinion page. “Goddamn Republicans, ruining our country.” The grumbling had begun. I’d brace myself for the onslaught. “They are taking money out of my pocket!” Pop would roar. I knew what was coming next. Usually a slur on some Republican in office, state or local would do. “Damn Rousakis. Mealy mouth Greek!” (For years I had no idea what this meant until Mom explained how Rousakis was the Republican Mayor of Savanna and thus my Grandfather's mortal enemy) At this point, Pop would overhear my giggling and knew that small ears might repeat these bold statements with a strong probability, in front of Grandma. Pop moved on to Sports and we’d talk about a safer subject like the Braves. I went through all this to explain how I have become much like my Pop. The Savannah Morning News sends free copies to our high school every day. Part of my morning routine is reading the paper, front to back, during slow moments in class. At first, it was just Accent so I could read what passes for the Funnah papers these days followed by the crossword. They say you become your family so it was my destiny to repeat my grand pop. I am also addicted to the Opinion page now. 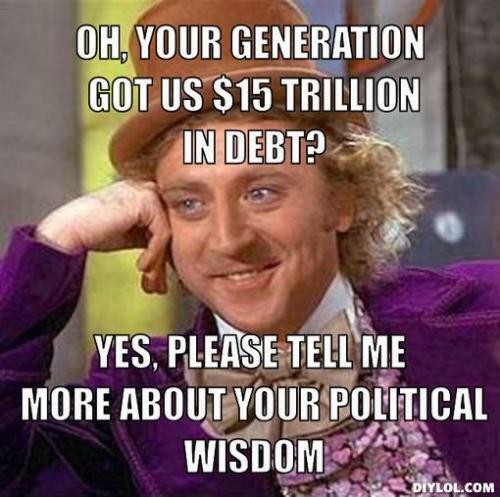 I have to read the political cartoons, Letters to the Editor, and any nuggets about education. I find myself getting whipped up in frenzy when I read what stupid ideas the government, Board, or elected officials are trying to pass of as representing the people. I catch myself, shake my head, and then laugh at myself. It could be worse. This is Mark Streeter, Savannah's resident Political cartoonist. He is awesome. While I am not the yellow dog Democrat my Pop was, I do get increasingly frustrated with how the government runs as compared to how it was set up by the framers of the Constitution. Don’t misinterpret. I love my country yet I am frustrated with how the government interferes in aspects of daily life where they have no business except to tax. Kim and I decided to have a wedding. So obviously we have to pick somewhere. Now I am guessing that it’s common knowledge how any church will collapse upon my entry so scratch that option. Besides, we are two unique and interesting people. We need a venue that reflects our character. Many people suggested Tybee Island without realizing my history with Satan’s Step-daughter, B.K. (Before Kim). Frankly, I feel it is bad luck to get re-married at a previous spot. On top of all that, the fiasco at the beach taught me a valuable lesson regarding outdoor weddings. The beach is not only very windy in Savannah during springtime. It’s not very understanding of the “Big Day.” It was like a sandstorm on Tattooine (Only Star Wars purist will get that joke). Forsyth Park came up very early on. Kim and I loved the idea because this place is the perfect backdrop to hold our small wedding. Kim looked into it. Apparently, we have to have a permit even though it’s a public place. Ok, Tybee charged the fee too. It came out to be about 50 bucks. Very reasonable. The permit fee was ridiculous. Well into three digits. I was raised in believing how it’s tacky to discuss money matters in public so I’ll leave it at that. I will point out how the City of Savannah wanted to charge a rental fee on top of another fee because it was a holiday weekend. This is followed by a security deposit and I also have to rent a police officer. Now, if this was back in days of living in Atlanta, I could see the need for an officer due to some of our wedding antics that have occurred historically. We are all in our late 30s/40s and go to bed around 10 or 11 these days. Security? You have got to be kidding. On top of all that, my “Pop” moment hit me when I realized how Forsyth Park is supposed to be free and open to the public to come and go as they please. My buddy and U.S. History co-teacher, Steve Freenor went through the same thing when he got hitched to his lovely bride, Shelley. Steve suggested just taking over a square and have the ceremony. No fuss, no muss. Kim was fine with this so we began to look at different squares. Initially we picked Warren Square. Warren was part of my old ghost tour route so I know it well. It’s always been a favorite of mine with its low hanging Live Oaks filled with Spanish moss. Smaller old house are crammed around it so it’s not as big of a tourist draw but reflects why I love this city so. I showed Kim some pictures and she agreed. My roommate and unofficial wedding advisor came up to me a few days ago with bad news. Dan had been out with some of his buddies over at Bar Food on Habersham. Dan shared my wedding ideas with his friends. They, in turn, reported how the local residents of that square can be down-right bastards in reporting anyone assembling there to the police. Younger Robby would have welcomed that moment to point out the social injustices/violations of the Freedom of Assembly. Older Robby recognized how he wants to give Kim a perfect day so the chance to fight the power might not go as the perfect wedding present. I called the city and faxed in the application. I spoke to a wonderful lady at the City Hall who was quite helpful. 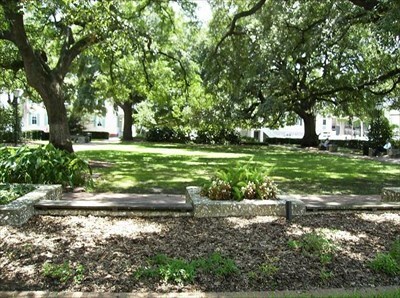 During our chat, I made the command decision to check on the availability of Forsyth Park. If I am going to do this, I am doing it right. Sherman gave Lincoln the city of Savannah as a Christmas present during his siege back in the Civil War. I am following suit. 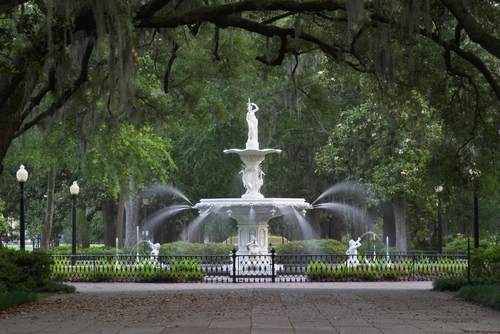 I am formally announcing on Saturday May 26th, from the hours of 8am to 11am I present to Kim Wade, her early wedding gift of the Forsyth Park Fountain. Opps, I mean Kim’s Fountain, which will be located at spacious Richardson Park. Come and join us. I am setting up stakes right at 7:59am. Enjoy Starbucks Coffee and pastries over the Roni and Jude’ Café while we enjoy our park and await the arrival of the most beautiful bride in the world to accept her gift and grant me her hand in marriage. I love you, Texas. Until the End of the World……. In response to "Coming Clean"